I believe marriage is one of life's greatest adventures and that your wedding day should reflect that. My couples are the kind who are focused on having a meaningful + intentional day, not just following tradition for the sake of it. My passion is serving couples who are passionate about making their day one that makes them happy and value unique wedding photography. I am a wedding photographer based in Iowa City, IA, but travel frequently and would love to shoot your destination wedding or elopement. I love having the opportunity to be a traveling wedding photographer and I would be honored to tell your love story through imagery whether it’s a Midwest backyard wedding, a mountain elopement, or an intimate ceremony on the coast. I'd love to help you create a unique wedding day tailored to you and your love, and provide imagery to perfectly tell the story of your day. My style is focused on capturing candid moments and raw emotion. I'll help direct you to get gorgeous portraits as well, but we'll never be caught doing a stiff prom pose or weird poses just for the ‘gram. I want to capture your story in an authentic way, by observing how you naturally interact. If you care about moments over stuff and think we would be a good fit, head to my contact page so we can meet and be friends! Since I’m a traveling wedding photographer, a few places on my bucket list for an elopement are: Rocky Mountains in Colorado, a Tulum beach elopement, an intimate wedding in the green hills of Scotland, or a romantic Cliffs of Moher, Ireland elopement. I’m happy to travel anywhere with you! I’m not the photographer who just cares about showing up, getting some posed photos, and leaving. I actually care about you! I want you to look at the photos and remember how special your day was! This includes the messy, unplanned moments. The tears rolling down your grandma’s cheeks, the totally crazy wind-blown hair, the dog eating the cake at your backyard wedding, the bad dance moves under a full moon. I capture it all. I want you to feel the adventure of your elopement in your photos and the love of the people surrounding you on your wedding day. Your photos don’t need to be perfect in the wedding industry sense, they need to feel like you! I absolutely love weddings, which is why I couldn't imagine a better job than being a Midwest and destination wedding photographer. I feel honored every time a couple invites me to capture the memories from a special day in their life. There's no one more excited for your wedding day than you and your fiance, but I would argue that I'm a pretty close third. Let's chat and discuss if we're a good fit! I think there is something really special about choosing to forgo tradition and choose to spend the day in a laid-back way with just you and your significant other, and maybe a few friends and family members. I'd love to be one of the lucky few to be present at your elopement or intimate wedding. I had a tiny, intimate wedding of my own in Breckenridge, Colorado, so I have tons of tips and I'd be honored to be your elopement photographer. This may be a given since I choose to photograph weddings + elopements for a living, but I absolutely love LOVE. I draw a lot of my inspiration in life based on my relationships and how humans choose to love one another. That's why couple sessions are so special to me. I love providing a prompt and seeing how each couple makes it unique to them because their love is so unique. Couple sessions are perfect for anniversary, just because, or engagements! Documenting moments of you and your love on an adventure is one of my FAVORITE things. Rather than putting on your fanciest outfits, getting perfect hair and make up, and posing while smiling at the camera - let’s get REAL. Let’s go on a hike together and let me capture all the goofy, silly, in-between moments. I value authentic over staged and would like to adventure with you! I love being an Iowa City Wedding Photographer! I love this little college town and getting to capture love stories born out of my home state. I’m also passionate about traveling and would love to meet you anywhere to capture the story of your two getting married somewhere beautiful! If climbing a mountain in your wedding dress or hopping into the ocean at the end of your reception sounds bomb, I think we’d be a great fit! I would love for you to get in touch and we can build the perfect photography package for you. I'm happy to meet you wherever, but brownie points if it's Italy, because that's by far my favorite place in the world. Check out my travel schedule to see where I'm headed next! Golden, Autumn engagement session in Iowa City. 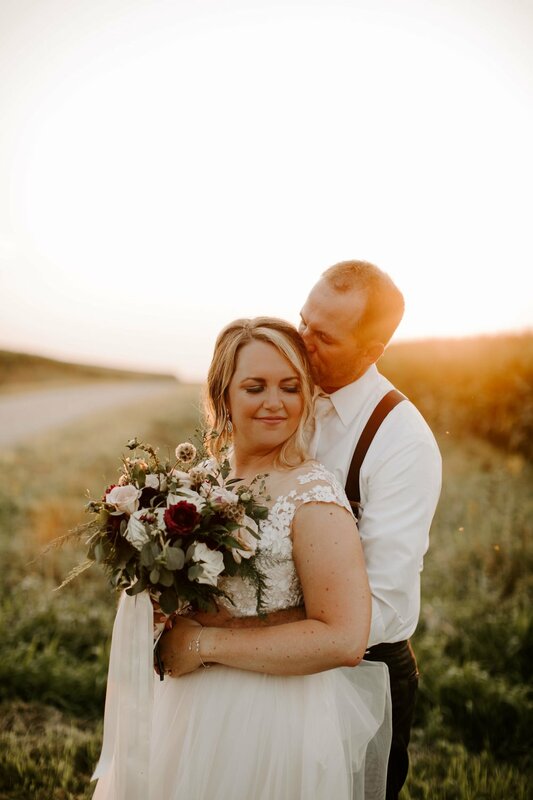 Beautiful, Iowa summer backyard wedding. Adventurous engagement session at Horsehoe Bend in Arizona. Adventurous hiking elopement in Dillon, CO.
Adventurous couple session in Big Sur, CA at sunset. Oregon Coast styled elopement near Cannon Beach.